In today’s new fiduciary environment, it is more important than ever before that retirement professionals gain the knowledge and skills needed to help American workers adequately prepare for retirement. The Certified Retirement Counselor (CRC) program was created over a two-year period in 1997 by the International Foundation for Retirement Education (InFRE) with our academic partner, Texas Tech University, and more than 100 retirement planning practitioners. 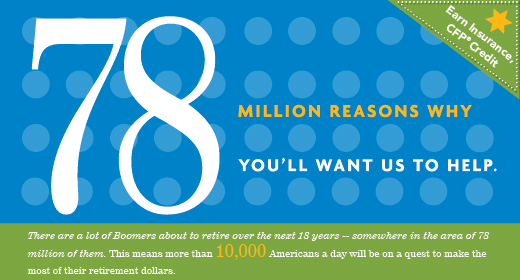 Becoming a CRC will enhance your understanding of retirement planning concepts and principles, while tangibly demonstrating your expertise and commitment to the retirement planning profession. The CRC program distinguishes itself from other retirement designations in that it covers both retirement income and accumulation planning. To ensure the CRC exam is testing knowledge of the most recent up-to-date and relevant retirement planning concepts, InFRE conducts a comprehensive industry practice analysis every five years. The optional study materials help retirement professionals apply a consultative, process-oriented approach to help clients make more informed retirement planning decisions. The CRC program can be one answer to professional development needs related to the Department of Labor (DOL) Fiduciary Rule and the CRC Code of Ethics includes as one of its’ principles, “Acting in the best interest of the client or retirement plan participant”. The CRC is accredited by the National Commission for Certifying Agencies (NCCA). Independent third-party “program” accreditation for a professional certification provides impartial, third-party validation that the designation has met recognized credentialing standards for development, implementation, and maintenance. The premise behind NCCA accreditation standards is to ensure the health, welfare and safety of the public with certification programs that assess professional competency. Out of the 170 designations listed on the FINRA website, only seven are shown to be independently accredited. Fortify your retirement expertise by becoming a Certified Retirement Counselor (CRC) Certificant! The International Foundation for Retirement Education’s (InFRE) plan administration courses are designed and updated under the guidance of the National Association of Government Defined Contribution Administrators’ (NAGDCA) current and past leadership to help public sector defined contribution plans build the expertise they need to meet the challenges of the new retirement environment. InFRE is NAGDCA’s trusted partner for providing the most effective and credible retirement-specific professional development, retirement counselor certification and certificate training courses designed specifically for public sector defined contribution and defined benefit plans. Perfect for those with new to intermediate level skills, this is the fourth course in the four-part series designed specifically for public defined contribution administrators. Your presenter for this session is Mary Willett, CRA, CRC®, of Willett Consulting, an independent benefit plan consultant in Oregon, Wisconsin with more than twenty years experience in the field of public employee retirement benefits. Mary is an expert in public sector retirement plans, specializing in Section 457 deferred compensation plans, 403(b) tax sheltered annuity programs and 401(a) qualified pension plans. She currently works with government employers, industry members and other consultants on projects pertaining to public sector retirement programs. She has been a member of the National Association of Government Defined Contribution Administrators (NAGDCA) since 1991 and served on the governing board for seven years, ending her Board term as the 2001/2002 president. Mary has also been involved with the International Foundation for Retirement Education (InFRE) since its inception in 1997 and holds InFRE’s Certified Retirement Administrator (CRA) designation and Certified Retirement Counselor ® (CRC®) certification. In “Retirement Income Planning: Learning the Hard Way,” the CRC® was highlighted as one of the top 4 certifications for those interested in improving their professional skills in retirement income planning. InFRE’s Managing Director, Kevin Seibert, CFP®, CEBS, CRC®, was featured in this Institute for Credentialing Excellence video about leading accredited certification programs.